Holley Performance Products is proud to announce plug-and-play harnesses to use Holley's HP and Dominator EFI system with Ford's popular Mod Motor and Coyote platforms! With Holley EFI, you can take full control of every parameter in your Coyote or Mod Motor powered project. The days of figuring out complicated algorithms in the factory ECU are gone. Holley EFI can handle whatever combination you want to throw at it. Is your cam too wild for a MAF? Power adders? You name it, and Holley EFI can handle it. If you are swapping a Coyote or Mod Motor into a different car, there’s no need to track down an expensive factory ECU and wiring harness that doesn’t have a fraction of the features and usability of Holley EFI. From plug-and-play kits to additional options for customers who require the powerful Dominator ECU, it has never been easier to make your Ford do exactly what you want. Tanks Inc. now offers a narrowed corner EFI tank for first gen Camaro and Firebirds. Finally, there is an alternative to buying an expensive custom gas tank. No longer do you need to spend hours modifying your current tank. Built to clear up to a 345 tire with 3” exhaust Tanks Inc. has designed an affordable stock style powder coated gas tank ready for fuel injection. When installed, this tank has the appearance of a stock gas tank. However, the tank has all the internal baffling needed for late model engines. In addition this tank features a recess for the fuel pump and sending unit to ensure that you have adequate space for all of your fuel lines and wiring with no modification to your floor. Tanks Inc. has replaced the factory sending unit with the standard SAE 5 bolt sending unit to make gauge swapping a snap. Call us at the V8 Speed & Resto Shop for more info on this tank today - 314.783.8325 . Read more for fuel pump options and more photos! Holley debuted the revolutionary HydraMat™ Fuel Reservoir on December 11th, 2014 at the PRI trade show in Indianapolis. The HydraMat is a patent-pending fuel reservoir system designed to reduce fuel starvation issues present in hard cornering, acceleration, stopping, inclines, and low fuel conditions. It is in these situations that traditional fuel pick ups can be starved of fuel, which then introduces air into the fuel system resulting in poor engine performance and even engine stalling. 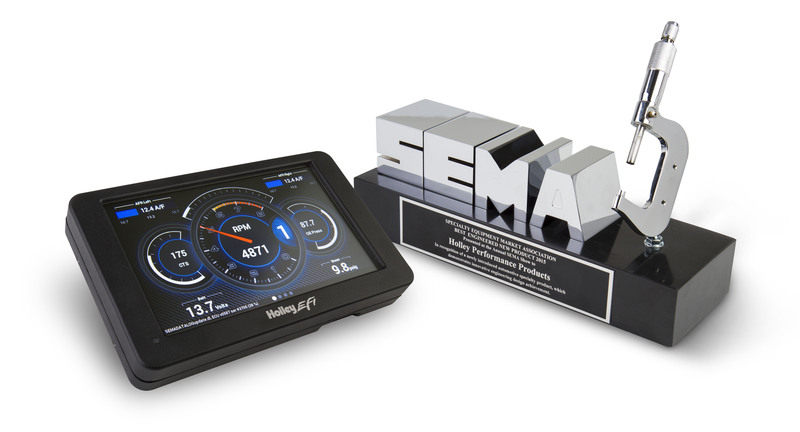 The soon to be realeased Holley EFI Digital Dash claimed the award for Best Engineered New Product at the 2014 SEMA show in Las Vegas, NV. The award is based on how innovative a new product is, the quality & workmanship of the product, and the overall technical achievement of the product. The Holley EFI Digital Dash features plug-and-play compatibility with all Holley EFI systems via a CANbus connection. The compact unit features a 7" low glare, high brightness, high contrast, full color touch screen for easy viewing, even in full sunlight. The screen provides nearly limitless customization, allowing users to choose multiple gauge and indicator types for use in a variety of motorsports applications. The Holley EFI Digital Dash also allows users to toggle through multiple active screens (tune, warm-up, race, drive, etc.) and setup user-defined alarms & configurable shift lights. It also allows on-screen playback of Holley EFI data logs and it has a digital switch panel that eliminates the need for mounting analog switches to control various aspects of the vehicle's drivetrain. Over the past few years, Holley Performance Products has come to the forefront of the EFI aftermarket with innovative products like their Terminator, HP, and Dominator EFI systems, as well as plug-and-play wiring harnesses for popular engines like the GM LS and Chrysler Gen III Hemis (Ford Coyote and Mod Motors coming soon). The introduction of the Holley EFI Digital Dash is the next step in the evolution of Holley's EFI product line. For more information on the ultimate add-on for your Holley EFI system, visit the individual product page HERE. The Holley EFI Digital Dash is scheduled to be available for purchase in mid-December. Holley is proud to announce the release of the new Shadow Black Ceramic Coating option for Street Demon Carburetors. The Shadow Black finish wraps up all the features of the Street Demon line in an aggressive and subtle package that also acts as a barrier to corrosion and heat. 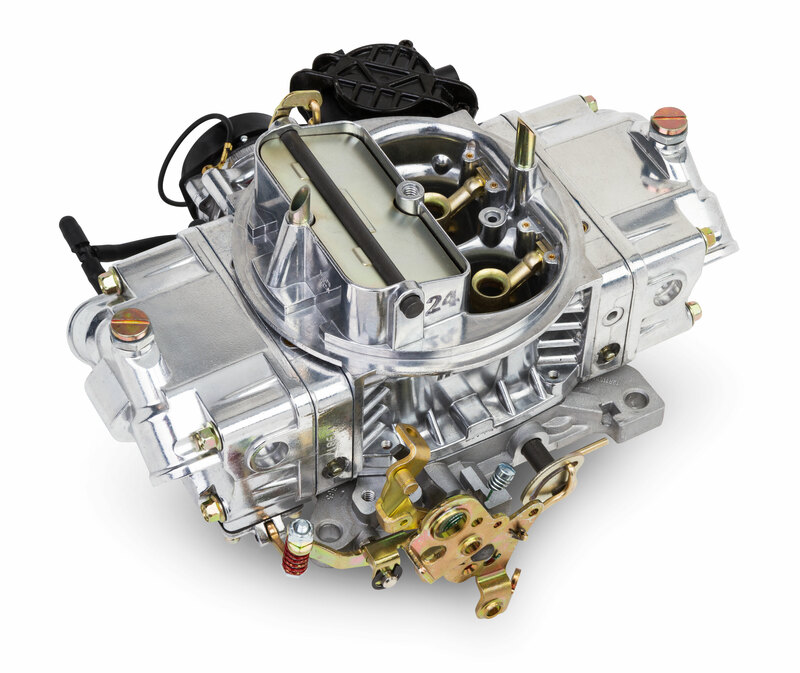 Street Demon carburetors are known for their clean looks, ease of use and revolutionary design. This design ensures a stable idle, crisp throttle response, and smooth performance. Their optimized calibrations and dual mounting pattern make them Run-Ready™ for a variety of engines and vehicles. 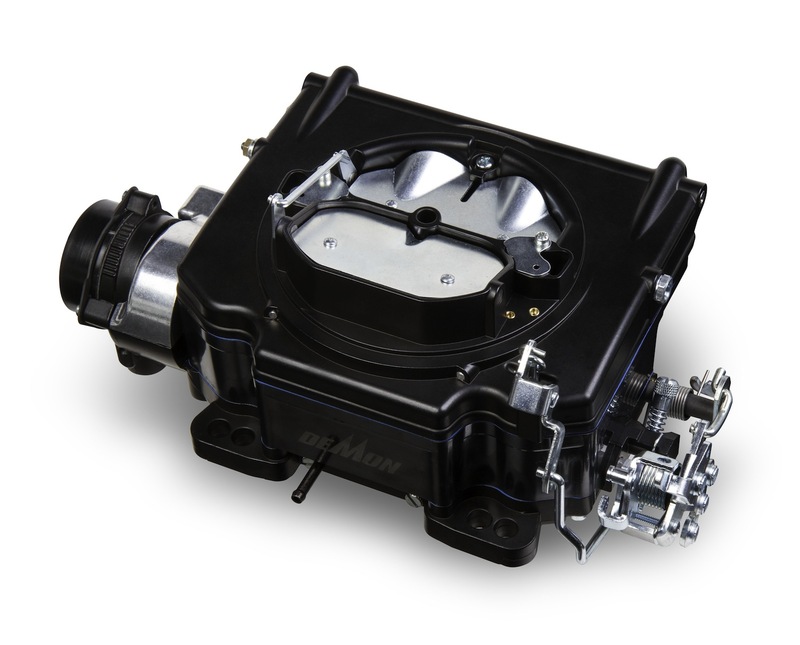 All of the popular and innovative features associated with these carburetors are included in the Shadow Black version, plus they utilize the Street Demon aerospace composite fuel bowl that keeps fuel up to 20° cooler. They have an integrated fuel bowl/main body with all gaskets above the fuel level to eliminate all potential leak paths. They feature small primary bores with triple stack boosters for excellent fuel economy and throttle response, plus a large Goggle Valve Secondary (GVS™) throttle plate that delivers over twice the airflow of the primaries for increased power. They’re available in both 625 and 750 CFM and all Holley Street Demon’s have Ford kickdown provisions, GM 700R4/200R4 provisions and available TPS kits for GM 4L60E/4L80E transmissions. Looking to convert your Corvette to EFI? Now there is an alternative to buying an expensive custom gas tank. No longer do you need to spend hours modifying your current tank. Tanks Inc. has designed an affordable stock style powder coated gas tank ready for fuel injection. When installed, this tank has the appearance of a stock gas tank. However, the tank has all the internal baffling needed for late model engines. In addition to the internal baffle system this tank features a recess for the fuel pump and sending unit to ensure that you have adequate space for all of your fuel lines and wiring. Tanks Inc. has replaced the factory sending unit with the standard SAE 5 bolt sending unit to make gauge swapping a snap. The price for the tank, pump and sender and straps is $530. For more information on this system as well as the complete Tanks Inc. line contact them at 877-596-3842 or www.tanksinc.com. Looking to convert your early Corvette to EFI? Finally, there is an alternative to buying an expensive custom gas tank. No longer do you need to spend hours modifying your current tank. Tanks Inc. has designed an affordable stock style powder coated gas tank ready for fuel injection. When installed, this tank has the appearance of a stock gas tank. However, the tank has all the internal baffling needed for late model engines. Tanks Inc. has replaced the factory sending unit with the standard SAE 5 bolt sending unit to make gauge swapping a snap. The price for the tank, pump and sender is $505. For more information on this system as well as the complete Tanks Inc. line contact them at 877-596-3842 or www.tanksinc.com. Holley is pleased to announce the addition of aluminum versions of the 870 CFM Street Avenger carbs. These carbs share all of the same features that the Street Avenger series is known for, but now with a 36% savings in weight. Being aluminum also means they will hold their shine longer! Street Avengers are ready to run right out of the box, and now they are better than ever! Saving weight optimizes every aspect of performance of your car, whether it is acceleration, braking, or handling. What better place to start than the top of your engine? Both the FAST™ EZ-EFI® and EZ-EFI 2.0® Multi-Port Self Tuning Fuel Injection Kits are perfect options for upgrading LS engines that have been part of an engine swap. LS engine transplants provide unlimited options for tuning and improved drivability. FAST™ EZ-EFI® Multi-Port Kits are one upgrade that lets users take advantage of these swaps in a big way; the kits allow owners of existing factory or aftermarket equipped, multi-port, fuel injected LS applications to experience the benefits of an EZ-EFI® system. There is no limit on horsepower because the system is based on each customer’s supplied injectors. Each FAST™ EZ-EFI® and EZ-EFI 2.0® setup features an easy-to-use interface that doesn’t require a laptop or tuning experience. The system actually tunes itself as the user drives, meaning that expensive trips to the shop for simple tuning issues are a thing of the past. What’s more, an uncomplicated OEM-quality wiring harness is included in the multi-port kit. A FAST™ XIM™ unit or EZ-LS™ Ignition is required (depending on application), allowing the user to easily monitor and adjust timing. This multi-port installation kit and all other FAST™ EZ-EFI ® systems are 100-percent designed and engineered by FAST™ staff. They feature a limited lifetime warranty and are backed by the industry’s most extensive technical support team. Holley is proud to introduce the all new Holley Mighty Mite electric fuel pumps. They’re big on performance, but small in size & price. They’re quiet, easy to install and work with gas, diesel, blended alcohol and E85. They will support up to 400 horsepower on a carbureted engine. They are self-priming and have a 12-inch dry lift capability for more flexible mounting.They are proudly made in the USA so it’s easy to see why you should make Holley Mighty Mite pumps part of your project.